May 27, 2018 at 8:59 pm. 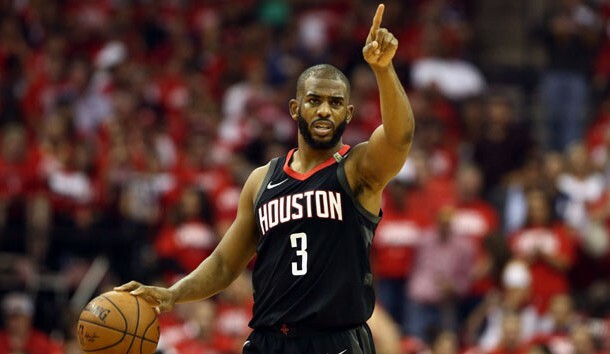 HOUSTON — There is something appropriate about the Houston Rockets’ championship aspirations hinging upon the availability of guard Chris Paul. His right hamstring strain could not only shift the balance of the Western Conference Finals, it might impact which team hoists the Larry O’Brien Trophy at the end of the NBA Finals and this postseason marred by injuries. Paul, acquired by the Rockets last offseason to provide the backcourt depth required to challenge the reigning champion Golden State Warriors, departed with 22.4 seconds remaining in Houston’s 98-94 win in Game 5 at Toyota Center and sat out Golden State’s 115-86 win in Game 6 at Oracle Arena. With Game 7 set for Monday at Toyota Center, Paul was listed as questionable by Rockets coach Mike D’Antoni, who described the rehab process as going good on Sunday. According to D’Antoni, Paul had yet to test the hamstring and has only received treatment. Team doctors will re-evaluate Paul on Monday, with the decision on his availability to be determined by tipoff. The Rockets raced to a 17-point lead in the first quarter of Game 6 only to run out of steam without Paul present to alleviate the pressure on fellow guards James Harden and Eric Gordon. Houston produced a paltry 25 points in the second half of their 115-86 setback. “The bottom line is we can’t turn it over and we need to do a better job,” D’Antoni said of the Rockets’ 21 turnovers in Game 6, with Harden (nine) and Gordon (five) responsible for two-thirds of that total. “But we knew this was hard. They’re champs. They were going to come back fighting and they did their part. The Warriors have never lacked confidence in this series, even while falling into a 3-2 deficit. However, their decisive victory in Game 6 served to reinforce the reality of what happens when they are at their best, especially with the Rockets short-handed missing such a significant piece. Golden State has survived without veteran swingman Andre Iguodala, who has missed the last three games of the series and is questionable for the finale with a left lateral leg contusion. Center Kevon Looney (sore left toe) is also questionable, but the Warriors remain undeterred. “I feel like we’re the best team in the world and the most fun team to watch when we’re pushing that ball and getting defensive stops, making the simple play,” said Warriors guard Klay Thompson, who scored a game-high 35 points while sinking nine 3-pointers. Shooting 49.4 percent from the floor, including 16 of 38 on 3-pointers while producing 26 assists on 43 field goals, the Warriors again featured the offense that ran roughshod over the NBA. When the Warriors get rolling, the only thing that appears capable of slowing their progress is their own complacency. “I thought we could have gotten this done earlier,” Warriors forward Draymond Green said. “I think in Game 4 we kind of gave the game away, and in Game 5 I think we gave the game away. But nonetheless, we know how good of a ballclub they are, and we knew that it wasn’t going to be easy. After Game 6, D’Antoni revisited a moment from the offseason when the team convened in the Bahamas. He asked, rhetorically, if the Rockets would take a Game 7 on their home court against the Warriors and, in a heartbeat, D’Antoni acknowledged the benefit of that scenario. Despite their injury concerns and even against the significant odds of defeating Golden State a fourth time, the Rockets have the Warriors right where they want them. Finishing the series with a victory won’t be easy, but it will be made easier hosting that showdown in Houston.